“France’s leading independent hygiene producer” is a phrase that comes up often during TWM’s interview with MP Hygiene’s president and chief executive Marc Miribel. The French tissue market is dominated by the world’s biggest global players, which makes it a unique point that MP Hygiene MP Hygiene is now run by the great grandson of founder Louis- Alexis Miribel, and that the company’s market strategy remains proudly and fiercely independent some 152 years later, carefully protected by a family of entrepreneurs. Miribel is in turn modest and enthusiastic, quick to laugh, and speaks fluently in English. We meet at the company’s snow-covered integrated plant located in the picturesque French commune of Annonay in the Rhône-Alpes region of southern France. Established in 1863, he took over the company in 1997 and after viewing opportunities in the market gave the business a new focus: hygiene. At the time the company had a €6m turnover and 50 staff. It is now a €60m turnover company and produces 30,000tpy across four sites and on 21 converting lines mainly from suppliers Gambini and United Converting. 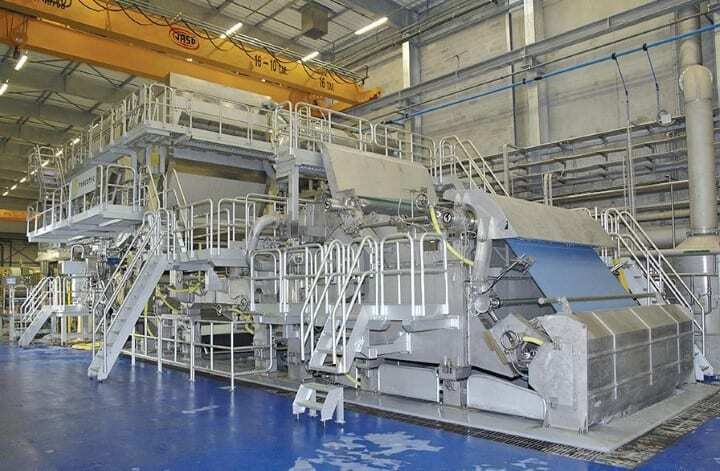 It had been buying parent rolls from Italy, but in 2012 it became fully integrated with the start up of its first tissue machine, supplied by Toscotec. “We made this purchase to be competitive as we were buying parent rolls in from Italy,” Miribel says. “We also wanted to have better control over quality and to be completely independent. It would have been difficult to grow and stay competitive without it.” The investment cost €30m and is the only major investment made in this region of France in the last 20 years. The move to hygiene was a vital decision: with the arrival of the euro and the abolition of border controls in 2003, the Italians started to sell directly to French retailers and meant MP Hygiene was at risk of losing its competitive advantage. In 2009, the French market also saw a big demand for hygiene products due to the H1N1 flu virus. “France in general had a shortage in hand hygiene products, so there was a big opportunity for us,” he says. MP Hygiene now produces private label products for the AfH market, and products include paper wipes and dispensers, specialist wipes and soap, while 20% of its production is of nonwovens and disposable products. Location is also key: MP Hygiene is the only paper mill south of Lyon and it is close to the Italian and Spanish borders. He says the company faces competition from Spanish companies – notably Goma-Camps – and from small local converters in Italy, those around Lucca in particular. SCA, he adds, is the main competitor and has 50% of the French AfH market. The steps needed to maintain its position as France’s leading independent hygiene producer are largely already mapped out: “Our challenge is to maintain our growth. We’ve grown 10% year on year for the past three years and we have reached a certain level now where the challenge is to maintain 3% growth.” MP Hygiene has 15-20% of the French private label market share. Share the post "“Dream” of second PM within reach for fiercely independent French hygiene producer"